Something about the planet Mercury doesn’t sit right with astronomers: It’s too dark. Darker than the Moon, despite containing way less iron. But at long last, scientists have solved the mystery—and their discovery is shedding light on the fascinating past of the Solar System’s innermost planet. Mercury is slathered in graphite; the same slate-colored, carbon-based material we put in our pencils. What’s more, the patches of graphite on Mercury’s surface today may be the exposed remnants of a thick carbon crust that formed from an ancient lava ocean, according to a study published today in Nature Geoscience. It was about a year ago that scientists first suggested Mercury’s surface may be dark because of carbon, instead of more typical darkening agents like iron or titanium. Performing model simulations, astronomers showed that Mercury might have been battered with graphite-rich comets during the early days of the Solar System. But it was NASA’s MESSENGER mission—the first space probe to conduct a detailed geologic survey of Mercury’s surface, from 2011 to 2015—that collected direct evidence for graphite. “We used MESSENGER’s Neutron Spectrometer to spatially resolve the distribution of carbon and found that it is correlated with the darkest material on Mercury, and this material most likely originated deep in the crust,” study co-author Larry Nittler, the Deputy Principal Investigator on the MESSENGER mission, explained in a statement. 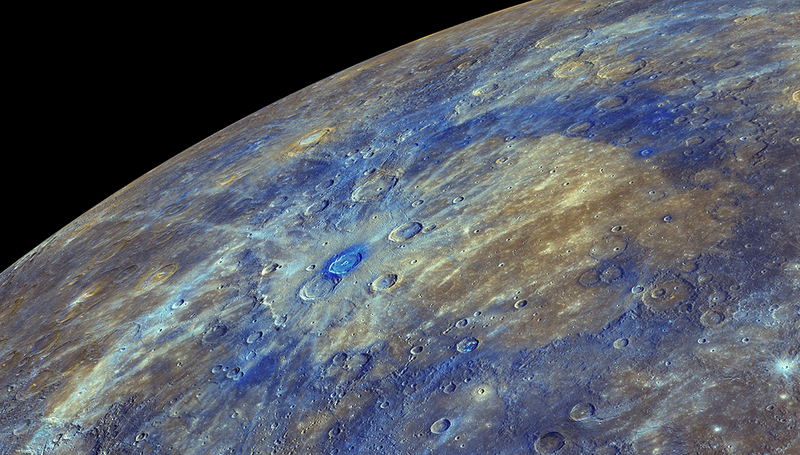 The graphite data, collected during low-altitude flyovers in the final days of MESSENGER’s mission, indicates that Mercury’s surface could be made up of a few percent carbon, much more than other rocky planets in our Solar System. And rather than delivery-via-comets, MESSENGER’s data is consistent with indigenous carbon that originated deep within the planet. When Mercury was young and even hotter than it is today, its surface was a roiling mess of magma. Graphite, the authors say, could have crystallized out of that magma ocean, forming a primordial crust, the remnants of which sit beneath the planet’s surface today and are exposed during extraterrestrial impacts. The study underscores just how little we know about the Solar System’s smallest planet, which has only been visited by two space probes. It is a world far more alien to us than Pluto, despite sitting 3 billion miles closer to home. But learning more about this strange little planet could shed light on the types of worlds we expect to find orbiting other stars.